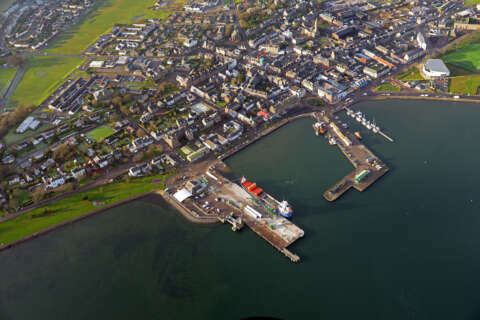 A commercially flexible port situated on the southern tip of Kintyre. It is ideally suited to service the needs of the renewables market off the west coast of Scotland, Northern Ireland and NorthWest England. Piloatge/ ISPS/ Compliant/ Cargo Handling facilties. £12M has recently been invested in upgrading this international commercial leeside port accommodating vessels up to 160m and comprising the Old Quay and New Quay. It has 9M water depth to chart datum, 30kN/m2 Quayside weight bearing and craneage capacity of 1,000T. This project was part funded with European Regional Development Funding. This directory has been developed as a collaboration between Scottish Enterprise, Highlands & Islands Enterprise and the British Ports Association (BPA), the UK’s leading port association. BPA will host, administer and manage the directory. The information contained in these pages is provided by the ports themselves and updated on a regular basis. This directory offers an introduction to our Scottish ports – for further details please contact the ports direct using the contact details provided within each port overview section. Chart Datum (CD) is a level set low enough to ensure that the tide rarely falls below it. The UK usually determines this as being approximately the level of Lowest Astronomical Tide. In effect, this is the minimum depth that can be achieved by a quayside or port entrance channel. Length overall (LOA) means the maximum length of a vessel's hull when measured parallel to the waterline. A ship’s beam refers to its width at the widest point, when measured at the ship's nominal waterline. The draft of a ship's hull is the vertical distance between the waterline and the bottom of the hull (keel), which includes the thickness of the hull. The draft of a ship or boat signifies the minimum depth of water it can safely navigate.